I was in Bilka (the big giant Danish grocery store) yesterday and as always, I PEEKED OVER at the Ice Cream Section. I do not do this routine check because I am a huge ice cream addict; rather I do it because there is ONE particular kind of ice cream that I LOVE. In fact, it is the ONLY kind of ice cream I will usually eat... MINT CHOCOLATE CHIP. Now I would PREFER to have my Mint Chocolate Chip Ice Cream in a carton that says BLUE BELL, but seeing as how I don't live in the state that produces Blue Bell any longer, I cannot afford to be picky. Ok, I digress. About 6 months ago, Mads and I stumbled across a TREASURE at Bilka. 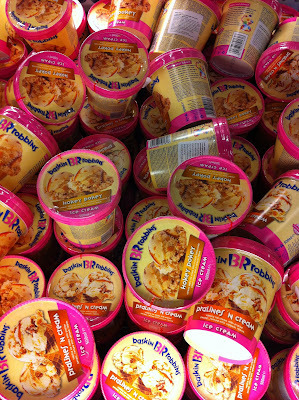 We were walking by the ice cream freezer, on the way to the bread section, when WHAT TO MY WONDERING EYES DID APPEAR but a freezer full of Baskin Robbins Ice Cream pint-sized ice cream for FIFTEEN KRONER a piece. Typically the pint-sized ice cream (Ben & Jerry's or Baskin Robbins) is about 50kr a piece (10 US dollars), but on this particular day, it was ON SALE FOR FIFTEEN KRONER! I think a "hallelujah" could be heard all throughout Bilka that day! Needless to say on that day, they had EIGHT PINTS of Baskin Robbins Mint Chocolate Chip Ice Cream--- and yes, you guessed it, WE BOUGHT ALL EIGHT. We were like scavengers, digging through the freezer case. So fast forward to yesterday. Bilka had ANOTHER Baskin Robbins sale.... 15 kroner per pint.... and you guessed it, I STARTED TO DIG! However, my efforts were all for naught.... as the only flavors that were on sale yesterday were "Pralines and Cream"and Hokey Pokey, which of course, I did not buy. However this Grocery Store Adventure got me to thinking.... What on earth must the Danes think about us Americans when they see ice cream flavors called things like HOKEY POKEY??? Do folks in Denmark know what the Hokey Pokey is?? And I wonder...what does Hokey Pokey even taste like?? Maybe I should I have bought one just to find out how ice cream tastes when you "put your right hand in and take your right hand out and then shake it all about...." Maybe I will go and get a pint or two and bring them home tonight and find out if Mads knows how to do the Hokey Pokey! Hokey Pokey is "White chocolate flavour ice cream with crunchy honeycomb candy pieces and a caramel ribbon" Sounds yummy! ROFL Jon! That is the PERFECT COMMENT! I give you major props for living in a country that doesn't have Blue Bell readily accessible!!! Blue Bell Cookies & Cream is my favorite!!! We call "Hokey pokey" "Ooogy boogy" but we have the same song. I am a die hard mint chocolate chip fan. There is an ice cream booth with the best I have ever had right in the Herning shopping center. It is not to be missed! Since I ate that, I no longer even like mint chocolate chip, or any ice cream for that matter, in North America!